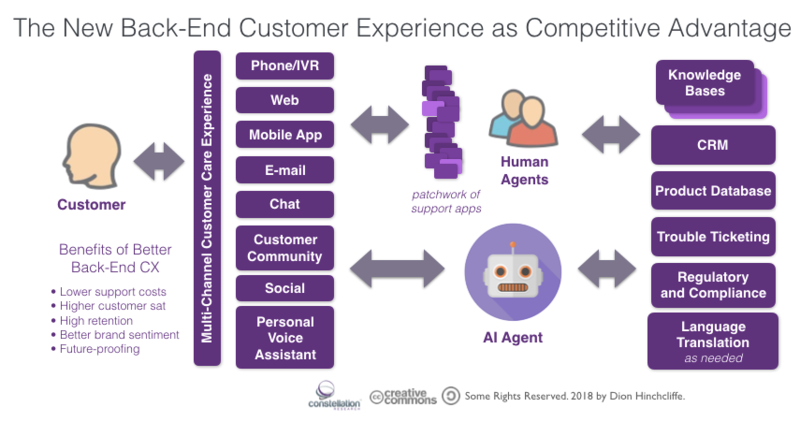 The Digital Transformation of Back-End Customer Experience: What Leaders of The New C-Suite Are Thinking | Constellation Research Inc. While the marketing and sales side of customer experience (CX) still receives by far the lion's share of attention and investment today, it's the back end part of the customer journey (support and service) that remains one of the most essential elements, at least as far as the customer is concerned. In fact, in today's increasingly customer-centric operating environment, this particular experience segment has become a core area of focus by leadership in the enterprise too. This is despite the fact that customer care and contact center efforts are offered perceived as necessary overheads and cost centers, given that they do not usually directly drive revenue growth. Nevertheless, across the board, we can see that organizations that invest in the most vital aspects of customer experience are exceeding their business goals at nearly twice the rate of those that do not according to a recent study by Adobe. More tellingly, it's the back-end of customer experience -- namely the journey that the customer takes and the experience that they encounter when they need help with a company's products and services -- that can most actively drive retention. This makes the all-too-frequent neglect of customer care unfortunately, as even modest investements in retention can have major business impact: Bain reports that a 5% increase in customer retention spending can increase a company's profitabilty by a relatively dramatic 75%. It was with this backdrop that I attended CCW Executive Exchange this week in Chicago, an exclusive confab of senior executives who are charged with transforming the customer care experience in their organizations. From the nearly two dozen conversation I had with customer care leaders in some of the top industries in the world (banking, insurance, manufacturing, healthcare, and consumer social media), I was able to derive the current issues and mindset of those seeking to uplevel their customer care, customer service, and contact/call center efforts. A few insights from this week are gratifying: Namely that there is a general acceptance that the world is rapidly changing and that new customer engagement methods are needed that are simpler, faster, and more satisfying (for what these are, see below.) The second is that investment is clearly up, especially in digital channels, and there is more appreciation for technology that can actively improve customer satisfaction and retention. Operational complexity remains the leading barrier to back-end CX success. In my conversations this week with customer care executives, it was evident it is just plain difficult to provide good, consistent support across a large and growing number of channels. It's also getting harder as social media, intelligent chatbots, voice assistants, and other new technology channels increasingly becomes central to the experience. What's more, channel fragmention within the contact center itself, a too-neglected and highly impactful topic in my experience, is getting worse even faster. From my sampling of well over a dozen organizations, it was commonplace for back-end CX staff to have to learn and operate 20-30 software applications (or more) to meet customer needs today. This makes the job hard to do for relatively unskilled labor and is contributing significantly to attrition according to those I spoke with. Thus, channel and app fragmentation is making complexity management in back-end CX one of the top strategic objectives according to the executive I encountered. Integrated digital experience tools and customer experience management platforms were some solutions discussed, but it's abundantly clear that the industry has a lot more work to do to resolve and make the end-to-end experience better for both customers and contact center agents. Regulation is limiting experimentation and innovation in customer care CX. There are two major headwinds here: a) The very constrained customer care experience possible in open digital channels due to regulation and, b) the limited supporting feature set that digital platforms such as consumer social networks make available to organizations to safely engage in customer conversations involving personal data. These two barriers are holding back many organizations from realizing more impactful results in certain digital channels. GDPR is wagging the dog right now in conversations, but it was also clear that it's actively having a chilling effect on CX innovation right now. My take: Industries must rapidly engage their regulatory entities at scale to make needed remediation before further regulation makes great customer experience much harder. This is a tough boat to row, but the only other choice is to take the consequences, and this was a very real and active debate that I with executives at the event: Are the regulatory penalties going to end up as the new tax that companies simply must pay to be CX leaders? Emerging tech is finally exciting line-of-business CX leaders with the possibilities. Most of the executives I talked with are experimenting with or have rolled out customer care bots of one kind or another. These were almost exclusively business execs and not IT types, so emerging tech is breaking through in a way I've not seen before in back-end CX. It was also clear that there is a bot proliferation/silo issue with marketing and sales, with some execs complaining that chat and bot interfaces are appearing all over their customer experiences with insufficient strategic planning and coordination. Other new technologes that excited executives were automation assisted agents that gave just-in-time aid to human contact center agents, or even acted as contact center agents themselves, unless the scenario escalated beyond what the automated system could handle. Gamification remains a hot topic to drive back-end CX performance, especially in the contact center. Atteendees were also widely considering various AI-powered bots that provide natural language interfaces, often with translation into other languages, in common digital channels like e-mail, voice, chat, and social channels. Alexa also came up numerous times as a new support channel. Language translation itself emerged as an important topic in many conversations and it was evident that this remains a problematic item to provide consistent cross-language CX, especially in regulated industries. Disappointingly, was that high leverage, highly strategic customer support options, like online communities -- which the data shows have the biggest bang for the buck of all -- are still of limited interest and comprehension by the executives I spoke with. The big takeaway: Business interest and investment in emerging tech in this segment of customer experience is up considerably in 2018. Overall, back-end CX is suffering from many of the same leadership/laggard issue as the rest of the industry, as new innovations and regulation go hand-in-hand to both give and take to make life complicated for executives who have to plan, invest, and execute to meet market, investor, and customer expectations. However, real solutions are increasingly being explored and discussed and tech providers are maturing their approaches and products to become more federated, integrated, and exclusive. Personally, I believe the burgeoning level of interest and investment evident at the CCX Executive Exchange is representative: It's a more exciting time to be in this segment than in quite a while. It's also one in which improved business results, while they may be indirect at times, are more accessible and cost-effective than ever before. I encourage those in The New C-Suite and in digital leadership in general to keep closely abreast of and incorporate the latest back-end CX technology methods into their end-to-end customer experience strategies.